Ridley Scott’s debut, and you can be quite sure he wouldn’t even consider making something as restrained, measured and thoughtful as this today. Or even 20 years ago, come to that. The Duellists announces him as a very different filmmaker to the one he has become. Sure, there’s the ever-present painterly eye, but one would take from this a director in thrall to the artistic sensibility rather than the commercial trough he’s mostly fed from since. This is a picture I maybe didn’t appreciate as much as I should have on first encounter, informed as I was by the more instantaneous delights of Alien and Blade Runner. But The Duellists fully deserves to stand along side those two as evidence of what Scott could do when he was still exploring his potential and hadn’t become frightened by his failures. 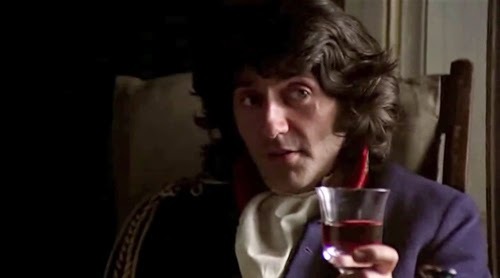 Comparison has been made with Kubrick’s Barry Lyndon, not least by Scott himself (understandably, he was in awe of the film’s cinematography). Really, though, they don’t share all that much besides visual aplomb and a general sense of period (Lyndon ends 11 years before The Duellists begins). 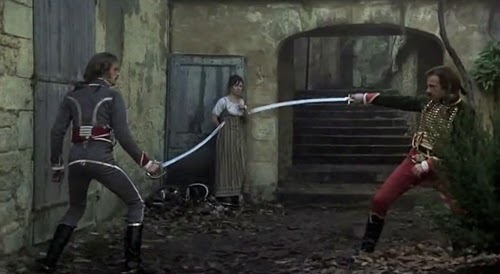 Sure, there are themes of honour and dishonour, running through both, but The Duellists (which isn’t to slight it at all) feels like a well-worn joke; one that has got more embellished with each telling while being fairly slight in essence. In contrast, Lyndon really fulfils its expansive remit of the rise and fall of Barry. 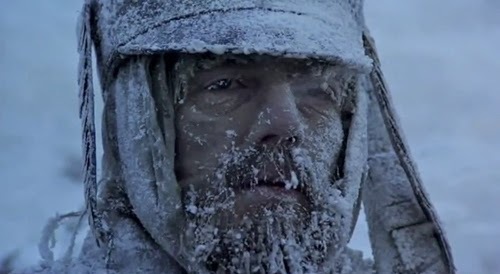 Kubrick’s film is mockingly narrated as a twisted black comedy. Where it falls short is with a lead actor who is such a blank presence that, while Ryan O’Neal could be argued to both serve and reduce the tale’s impact, it’s difficult not to conclude his presence is an entirely commercial necessity rather than a particular asset. Dr Jacquin: He fought a duel this morning. Armand d’Hubert: Yes, He also fought a duel this afternoon. 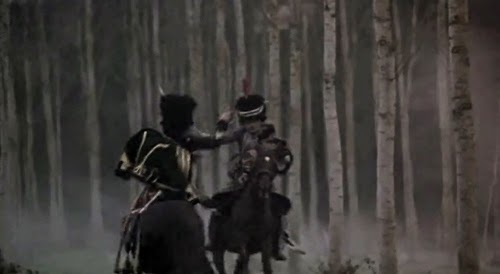 The Duellists’ joke is ingrained in the premise. Two Hussars repeatedly duel each other over several decades, but neither quite knows why. That’s enough, but one can’t help but think someone other than Scott might have also mined the material (Joseph Conrad’s novella, adapted by Gerald Vaughan-Hughes) for its humorous potential. There’s the occasional amusing exchange (above), but Scott’s picture is a very sombre one. It’s also very well cast. Filling out the support are great British actors like Robert Stephens, John McEnery, Tom Conti, and Albert Finney. However, leading duties are reserved for two American actors, Keith Carradine and Harvey Keitel. The narration would be provided by a third, Stacey Keach (much more perfunctory and less florid than Michael Horden’s in Lyndon). It’s a break with expectations (of English playing period, and period of any given nationality), and was effectively decreed by Paramount, but it works as a means of focusing our attentions on these two men apart. One has to wonder at the studio, however; what must they have been taking to seriously think these two leads might put bums on seats? 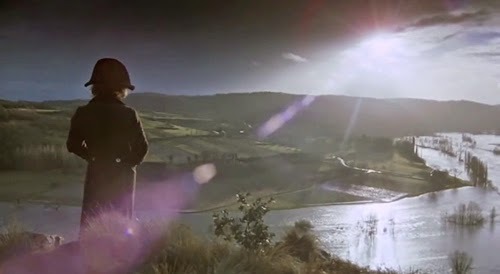 For Keitel, as Lieutenant Gabriel Feraud, this marked a period where he would make all sorts of pictures as if on a whim, ones that would frequently not pay off. Perhaps it was a consequence of being discarded from another adaptation of Conrad immediately prior, Apocalypse Now. He’s a glowering, vituperative ball of aggression throughout, perfectly cast on that level. 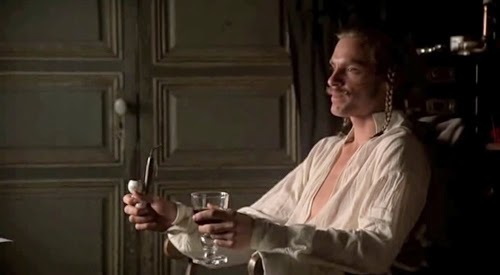 We don’t need to interrogate further just why he takes such a dislike to Carradine’s Lieutenant Armand d’Hubert. He’s the kind of abrasive type who would pick a fight with anyone at the drop of a hat. He lives to be offended, and to nurture his seething contempt. Scott and Vaughan-Hughes presumably agree that little extra is required, as they concentrate on d’Hubert. Carradine, never quite as prominent as his brother David, although he’s made more of an impact on TV in the past decade, initially displays a certain bemusement at Feraud’s unchecked aggression. Feraud is, after all, incredibly silly. But the realisation that these bouts aren’t going to stop any time soon, and continued brushes with mortal peril, encourage a diffidence only tempered by the code of honour requiring Armand, no matter what, to meet his adversary’s challenge. All else falls in line before this, including love and family. Carradine’s performance has a fragility to it, particularly set against Keitel’s blunt force, and works for a character who is nominally the hero, but only nominally. 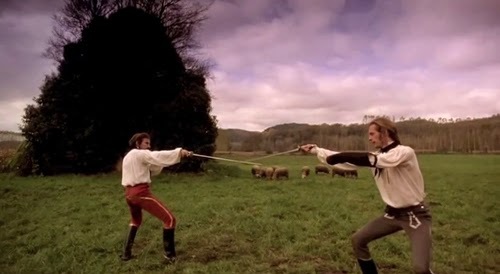 As far as we can tell, Feraud’s beef is that d’Hubert was unlucky enough to be the one ordered to place him under house arrest for (of course) fighting a duel. He may also have perceived other slights; d’Hubert arrested him at the house of a significant local lady, and he doesn’t respond quickly enough to the suggestion that he’d allow an insult to the Emperor to go undefended. D’Hubert’s reactions (“I see no reason whatsoever for us to fight”; “This is too ridiculous”) become no more comprehending as time goes by; he just becomes more resigned to the inevitable, seemingly fated to these periodic encounters. 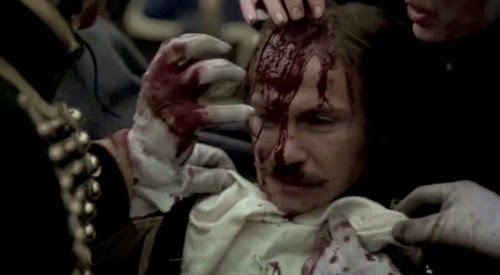 He tells Dr Jaquin (Conti) “All in all, I’m far from certain myself” regarding the reasons for the affront. Jaquin suggests, “Keep away from him, keep ahead of him, put your trust in Bonaparte”. Scott makes no bones about the duels being unpleasant ordeals. 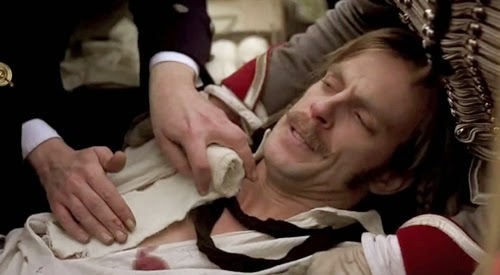 Injuries frequently occur, but Feraud is only preoccupied with continuing this aggression (“Next time, d’Hubert” he bellows when his opponent has to demur after being stabbed). On their third duel both are so exhausted they can hardly stand, until their seconds eventually intervene. Reason, even from Feraud’s own associates, comes to nothing; no one can assuage his belligerence. And throughout, there is this curious sense of honour. “Sir, I cannot fight a man three times and then tell tales on him” d’Hubert informs Brigadier-General Treillard (Stephens). So the years pass, the military fashions change, and the mode of engagement shifts too (in 1806 they duel on horseback, just to mix things up a little). 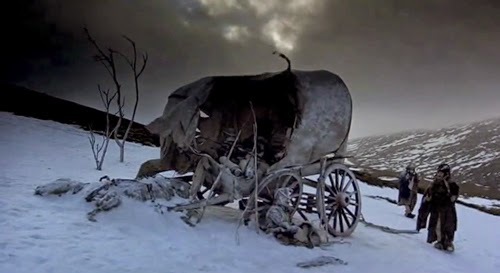 Another six years go by, and they reencounter each other during the retreat from Moscow. 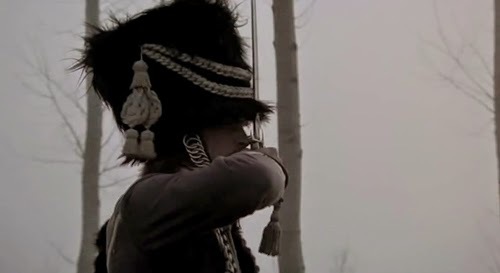 Despite teaming up to fight off Cossacks (d’Hubert, to no avail, perhaps thought he could break the ice amid the snow and ice), Feraud’s parting shot is “Pistols next time”. It isn’t until the political landscape changes and so do, nominally, allegiances, that Feraud can actually claim some substance to his campaign. Napoleon is exiled. D’Hubert marries into the aristocracy, and then joins the king’s army after Waterloo. 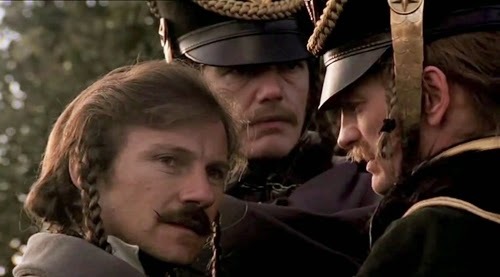 Feraud, who has declared d’Hubert a traitor, is detained for his loyalty to Napoleon. 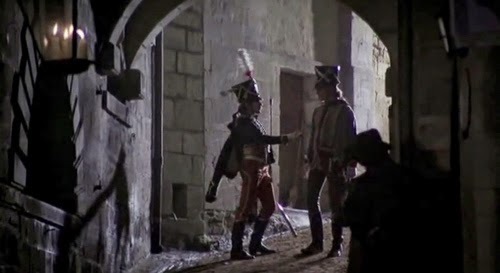 Unbeknownst to Feraud, d’Hubert gets him paroled (that honour again), which leads to the inevitable final meeting. With pistols. D’Hubert has the drop on Feraud, and instructs him “I have submitted to your notions of honour for long enough. You will now submit to mine”. Which entails d’Hubert now owning Feraud’s life. 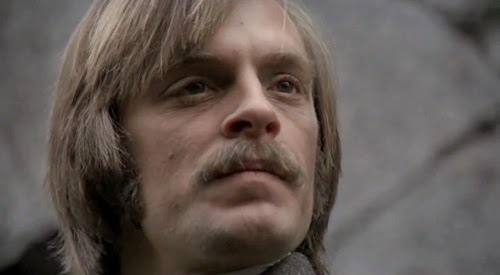 Feraud broodingly capitulates to the instruction that he will depart and conduct himself “as a dead man”. Joseph Conrad’s short story The Duel was based on an actual account, as Keach informs us during the opening. The bare facts are remarkably faithful; Fournier took offence at Dupont’s message and challenged him, leading to (at minimum), 30 duels over the next 19 years (in that sense, Scott actually reins in the hyperbole) that were only curtailed after Dupont bested Fournier in a pistol match. Despite the casting of very modern actors, Scott maintains a strong sense of period and manner. He touches on readily recognisable ideas, such as how they become minor celebrities through their constant sparring. There are also fanciful explanations for just why they are at each other’s throats (“He suggested you’d both been enemies in a previous life”). That’s no less plausible than the idea that The Duellists is a commentary on the pointlessness of war (why was it necessary for them to fight again? ); it may be in there, but Scott has never been much good at developing subtexts, so it’s best to pick and choose it as you will. This is a good film for cameos too. Besides those mentioned, Tom Howard from Howard’s Way (Maurice Colbourne) seconds Feraud during one passage. Norma from The Royle Family (Liz Smith) gives a tarot reading, and Pete Postlethwaite obliges Robert Stephens with a shave. The picture marked the beginning of David Putnam’s prestige period as producer (one that ended abruptly and decisively with the hubris of accepting the position of studio head at Columbia), having previously dabbled in musical tinged fare with mad Ken Russell, David Essex and Alan Parker (Bugsy Malone). For about 10 years he would maintain generally strong form, although this was the first and last time he worked with Scott (the same for composer Howard Blake and cinematographer Frank Tidy). 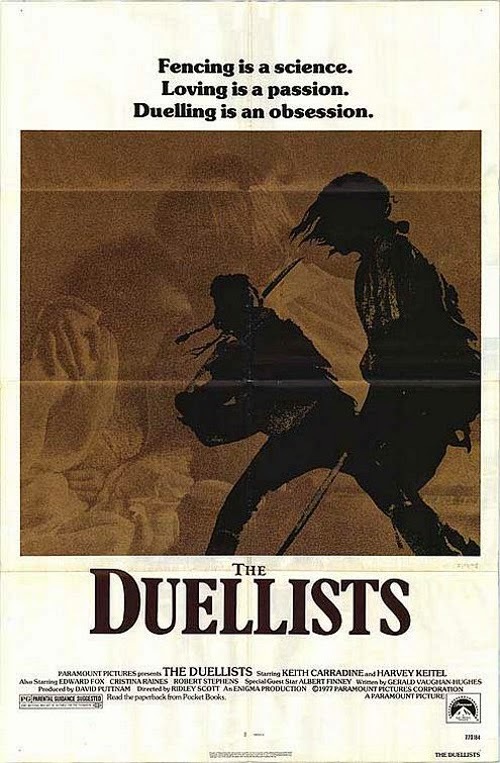 As a Ridley Scott film, The Duellists is a curiosity. It’s as non-representative of what would follow as The Hunger was for his brother Tony’s first feature. What it does have in common with the three films that would follow, however, is a director allowing world building content to significant degree. His early work allows the viewer to get lost in the conjured celluloid. After a certain point, that is no longer the case. Scott now has his eye on the economy of the edit and favours the monotony of an image that no longer surprises, it merely repeats. If you ask what attracted him to The Duellists, it was partly that it was public domain (he had wanted direct a movie, but needed to get there with limited resources), and then the Kubrick factor. Such lack of passion doesn’t adversely affect the film itself, however. None of his later historicals, not (the flawed but fascinating) 1492, not the acclaimed Gladiator, the leaden Kingdom of Heaven, pointless Robin Hood or bafflingly conceived Exodus: Gods and Kings, measure up to his first period piece. Scott was a much better director when he was exploring the possibilities of the motion picture.